Twice a year, Swarovski launches new products. They just announced their Fall/Winter 2017/2018 Crystal Innovations. As always, I find it a treat to see what they've come up with! I have to say that the new launch includes some things that I'm very excited about. I'm smitten with the Crystal Rainbow Dark and the new Iridescent Red Pearl. Both of them are darkly romantic. I also really love the new Swarovski Eye Pave Pendant and the Cross Tribe Pendants. When looking at components, I sometimes evaluate whether or not a piece already has content. In the case of seed beads, for example, there is indeed a lot of content, but it's subtle and they are more like building blocks. With art beads and particularly ones that are very iconic, I consider those to have "instant content". You can string it on a leather cord or a chain and it's already laden with symbolism and conveys part of that unspoken narrative. I love how the eye pendant has that "instant content". Now, the slippery slope with instant content is that it isn't universal and what it may mean for one person, may not be the same for the other. (I know lots of folks who do not like "evil eyes" and therefore would not share my love of the pave pendant.) And that's sort of my reaction to the new Male and Female Stones. Like I get that they're cool and there's a lot of innovation in producing them, but they're just not my bag of chips. I'm all for symbols... but these don't resonate with me. I feel like instead of celebrating equality, they sort of highlight the differences in genders. And I know that there are definitely differences between men and women, but I never bought into the whole Men Are From Mars and Women Are From Venus thing. I'm sure that there are many designers out there that will take these components and do wonderful things with them, but they just don't pluck my heartstrings. The new launch includes the Swarovski LacquerPRO Colors. And I think they're brilliant. If you look at any of the Pantone Color Reports, you'll notice that more muted and less technicolor hues are on trend. The new LacquerPRO Colors fit this perfectly. The Dark Grey Lacquer looks like it was kissed by smoke, the Dark Red Lacquer looks like a deep beautiful red wine, the Crystal Ivory reminds me of old piano keys – rich and warm with age and use, the Royal Green Lacquer makes me think of Dorthy adventure to see the Wizard in the Emerald City, and the Crystal Royal Blue Lacquer reminds of old comic books and that particular shade of chromatic blue. 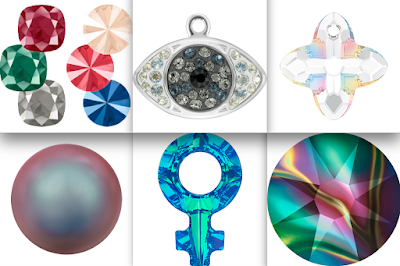 Swarovski has a bunch of other innovations, including new stone shapes, flatbacks, and accompanying settings. To see the full launch, CLICK HERE.